In support of the OpenQuest Bundle of Holding that is currently running until Tuesday 4th April, here’s the first in a series of posts that looks directly at the books that are on offer in that Bundle. This post looks at where it all started: OpenQuest. I’m a life long D100 fan from my introduction via RuneQuest 2 in the 80s, playing Call of Cthulhu and RuneQuest from the late 80s through the 90s. For a long time heavily house ruled D100 was my game of choice. Then in late 2006 a strange thing happened. My D100 gaming was on life support, I was dabbling heavily in Narrative Gaming via HeroQuest, since Glorantha was my muse at that time, and then suddenly RuneQuest came back. After being absent since the early 90s, when a crisis ridden Chaosium dropped it, Mongoose Publishing gained the license from its owner the venerable Greg Stafford. Because Mongoose had risen using the Open Gaming License during the halcyon days of the D20 revolution, they made the decision to create a System Resource Document (SRD) of the rules, effectively opening up their version of RuneQuest. 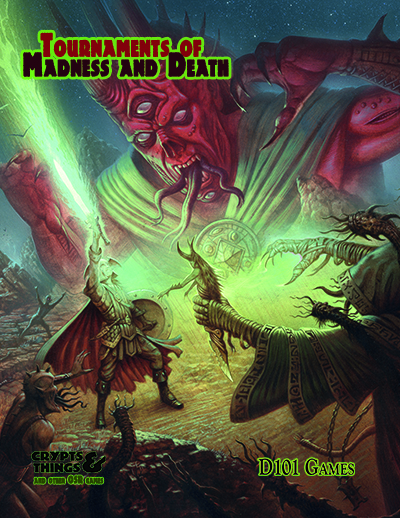 Initially I used the Mongoose RuneQuest SRD (MRQ SRD) as a basis for my scenario Life and Death (which also features in the current OpenQuest Bundle). Print on Demand publishing via Lulu had just opened up to me and the plan was to use it to sell Life and Death. Then I got thinking “Why don’t I quickly whizz through the MRQ SRD and write-up my house ruled system and make it available”? So this is what I did over a summer of lunchtimes. A rule set that could act as a common language for existing D100 fans. Therefore there was strong influence from old RQ2/RQ3 and some of the more playable aspects of Stormbringer as well as my own common sense house-ruling (the glue that held the bits together). This was important to me, since in the late 2000s D100 was really on life support, Chaosium was focused on Call of Cthulhu and Mongoose RQ never got widespread acceptance, and many of my friends on the UK Convention circuit were D100 fans. Something that could teach the joys of D100 Fantasy gaming to new players, both old and new. So the idea was that the game was accessible to some one who had not played fantasy roleplaying adventure games before and old hands who had spent most of their time in the closed class driven worlds of Dungeons and Dragons, who wanted to try out a D100 system but were put off by the perceived complexity. Something that suited my own gaming tastes yet could be taken apart for ideas by other D100 fans. Being humble and honest that I didn’t expect anyone else to use the game as written so I designed it to be modular and easily broken up into bits that could be used elsewhere. A system that used the best practices of old editions while fixing some of the shortcomings of those rules with my own house rules and modern gaming standards. 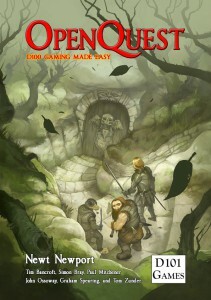 As a result I set out to write simple version of D100 gaming and that intial version of the game was called SimpleQuest. After a chat at a con with my friend Tom Zunder, who basically called me on my plan to have some bits Open licensed (under the OGL) and other bits (like the setting) Closed, it was decided to call the game OpenQuest – to reflect that the whole of the text (setting and all) would be Open. I think it also nicely sums up the Open style of classless game play. It also reinforces my first goal, which why such fine games as Cakebread & Walton’s Clockwork & Chivalry (which uses OpenQuest as its base and then upscales it to meet the political reality and black powder technology of the Early Modern Period, resulting in their Renaissance system) and Kristian Richard’s Age of Shadow (again a modified OpenQuest system which models Elves, Dwarfs and Humans against a Dark Lord and his creations: Sillmarillion with the Tolkien filed off). OpenQuest 2, the current version of the game, grew out of feedback from the fans. I had been so successful with my 2nd goal that extra explanation for players coming from D&D was required. OQ2 spends extra time explaining how to get the best out of the character generation and development system, how characters grew from dirtcrawlers to demi-gods and how magic fits in – from low magic settings where magic is a rare and powerful commodity to high magic settings were magic permeates the fabric of reality and everyone is adept at manipulating a bit of it to do even the most mundane jobs. I was brought up on big self-contained rules book courtesy of Games Workshop in the 1980s, and OpenQuest and the games based on it continue that tradition. OpenQuest 2 Deluxe is a 262 page book with an iconic wrap round cover Dragon with Elric like Sorcerer King by Jon Hodgson. The rules light nature of OpenQuest really pays off here, with a complete set of rules (with three magic system), a complete fantasy bestiary , copious player and GM advice, a quick-setting and even a starting adventure. That be said if you find big game books intimidating and/or want a nice small concise version in 6 inch by 9 inch US Tradepaper back format to use at the game table/fit in your man bag then OpenQuest Basic Edition is right up your street. If this sounds up your street check out OpenQuest in the Bundle of Holding.